What wine to drink is always a pertinant question when travelling. In Melbourne, however, it was quite simple to choose. Rolling. Complete with a lovely cyclist on the label. 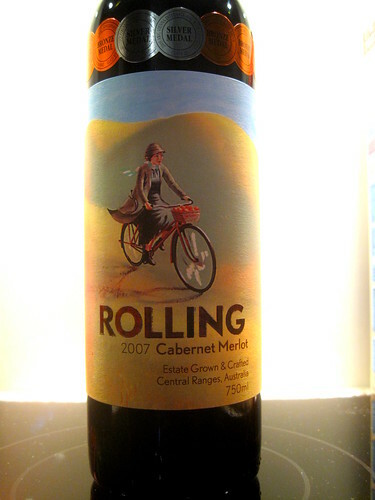 For more wine labels featuring bicycles and cyclists, check out this post over at Copenhagenize.com. Regarding the Rolling wine, great minds think alike. Sue over at Freedom Cyclist in Australia is way ahead of me! Living in Australia, my wife and I drink the Rolling quite regularly... We've also become a fan of the Cono Sur - both are fantastic wines! Unfortunatelly in Brazil I haven't found Rolling. We've just a few brand of good australian wines distributed here.